Roland launch their budget-priced rhythm composer, the TR505, which looks set to give Yamaha's RX21 and Korg's DDM110 a good run for their money. Ian Gilby picks up the beat. At £225,you could be forgiven for assuming that the TR505 would purely be a cut-down TR707. Well that isn't quite the full story for it offers some major improvements over its big brother, namely in the provision of 16 digitally recorded PCM drum sounds - four more than the TR707! And, in what is undoubtedly a clever move by Roland, these include five Latin percussion voices - low/hi congas, timbale and low/hi cowbell - which add spice to the standard kit sounds and remove the need to buy the 'latin version' later on. This increased number of sounds is offset by a reduction in the number of rhythm patterns offered. There are 48 very respectable preset rhythms available (Pattern Groups A, B, C 1-16) which cover a wide enough range of styles to heighten the TR505's appeal amongst all types of musician. If you dislike 'off the shelf' rhythms however, then a further 48 patterns can be created using Roland's standard method of step/real-time programming. These can be combined with the presets if you like to create a maximum of 423 bars, which can be split across the six available Track memories. The PCM drum sounds generated by the TR505 are realistic, being digitised recordings of real drums, and are surprisingly punchy and bright - better than you'd expect from a sampling frequency of 25kHz. Although 16 sounds are provided, only 8 can play simultaneously since the three toms, for instance, are the same sample but clocked out at slower rates to generate the necessary lower pitches. The pitch of each instrument is fixed, you can't adjust the tunings. In order to achieve such a remarkably low selling price, savings have had to be made somewhere and the most logical way to cut costs is by dispensing with sockets, switches, displays etc. And that's exactly what Roland have done. Gone are the 707's mechanical mixer sliders for adjusting individual drum volumes. These are replaced by a Level pushbutton and two increment buttons (up/down) which do allow you to set the volume of every sound across a six-step range for each pattern. Gone too are the handy LEDs above each step button found on the TR707. Don't be too disheartened though, for Roland have redeemed themselves by incorporating the same feature in the form of a graphic pattern/step display on the well laid out, easy to read, large, front panel LCD which is the very nerve centre of the TR505. Readouts for all functions are supplied, you simply have to call them up. More savings have been made by offering a split (right/left) stereo output with pre-panned drum sounds only - no separate voice outputs - which again seems to be the norm in this price bracket. I suppose the manufacturers all feel that anyone buying a 'budget' drum machine is unlikely to own a mixing desk with enough spare channels to cater for separate outputs anyway. The rear panel sports MIDI In and Out sockets but no Thru - the same with Yamaha's RX21. The unit is powered either from six AA batteries or mains via a 9V AC adaptor that plugs in the back. The TR505 utilises cassette dumping of rhythm patterns, having dispensed unfortunately with memory cartridges (the cost factor again). I say 'unfortunately' because saving of the entire memory contents takes an unbearable 40 minutes to complete. What is unforgivable, however, is Roland's decision to leave off both their DIN Sync connector and any form of analogue trigger output. 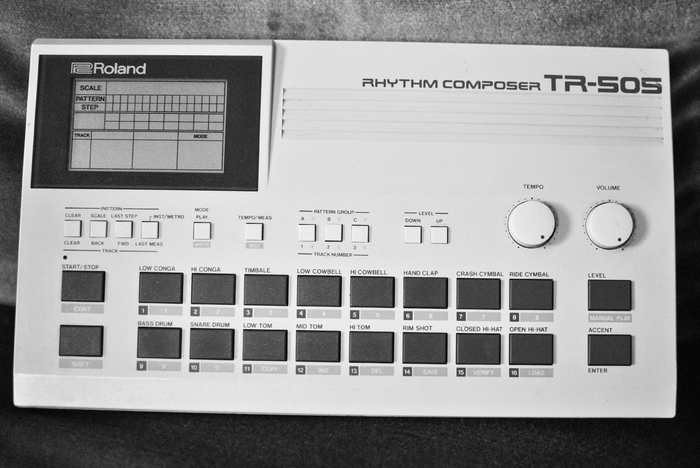 This means the TR505 cannot sync up to previous generations of non-MIDI Roland drum machines/sequencers without relying on an additional interface box of some sort. Is this Roland's way of telling us it's high time we junked the old stuff and went MIDI? They are probably right too, for the TR505 retails for a mere £100 more than the old Boss Dr Rhythm Graphic, yet offers an immense improvement over that machine in both sonic performance and programming facilities. Amazing isn't it? Writing and editing rhythms is an absolute doddle on the TR505, once you've come to terms with the frequent use of the Shift key and worked out how many times a particular button needs pressing. If you're at all familiar with the TR range then you'll have no trouble. Level control has already been mentioned, which can be used to instill dynamics into each voice in a whole pattern. In addition, there's the usual Accent feature which can be programmed for each beat of a pattern but this affects every voice that occurs on the accented beat to the same degree. The TR505 (like the 707) also responds to velocity information sent to it via MIDI which means it can be played dynamically from a MIDI keyboard, or a controller like Roland's own Octapad. Talking of MIDI, the TR505's MIDI implementation is more advanced than that of the TR707. When called up, all MIDI settings are displayed on the 505's LCD and can be accessed while rhythms are running without upsetting matters. Although the TR505 lacks separate voice outputs and triggers, each drum sound can be assigned its own MIDI channel so that a particular voice could then trigger external devices. Likewise, the MIDI note number for each drum can be selected by the user if desired instead of relying on the default values, which allows you to define the exact note on a MIDI keyboard you wish to play a particular drum sound. The TR505 also transmits and receives note on/off, song select, the MIDI sync signal (to start/stop) and, more importantly, song position pointers which are vital if you ever hope to use the device within an automated MIDI effects set-up. That about covers the facilities of this appealing new beat box. Having paid a small fortune myself some four years ago for a Roland TR808 drum machine - their flagship model at that time - I still can't quite come to terms with how improved a device their new TR505 truly is. For Roland to re-enter this sector of the market with a product this good is certain to put the cat among the pigeons. In my humble opinion, it deserves to be as successful as their original TR606. Available from all Roland stockists price £225.